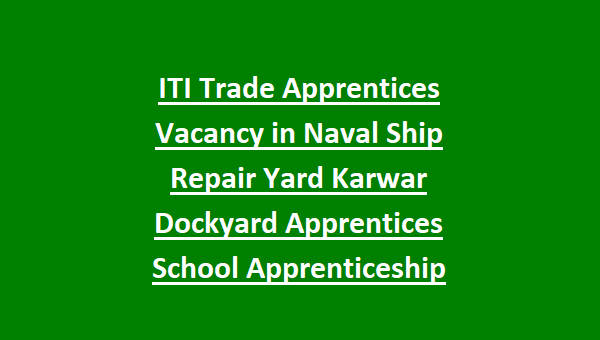 NSRY Karwar Recruitment for ITI Trade Apprentices: Naval Ship Repair Yard NSRY invites applications from the ITI qualified Male/Female candidates for the Apprenticeship Training at NSRY Karwar Dockyard Apprentices School for 2 years/1 year/6 months training as per Apprentices Act 1961. Candidates must have qualified ITI for applying for this NSRY Apprenticeship Training. Last date to reach the application form to DAS NSRY Karwar is within 30 days from the notification given in employment news. Candidates will be selected through written exam, document verification/interview and medical examination. Must have 50% of marks in Matriculation and 65% marks in ITI. 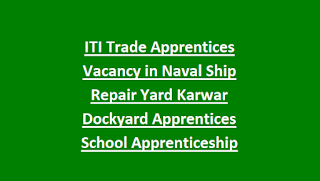 More details for this Karwar Dockyard Apprentice School Trade Apprentices Recruitment is given below. Within 30 days from the notification given in Employment News. There is total 150 trade apprentices vacancies in Naval Ship Repair Yard, Dockyard Apprentice School Karwar Recruitment 2018. Candidates must have qualified ITI in respective field. Must have 50% of marks in SSC/10th/Matriculation and 65% marks in ITI NCVT. For male candidates Height minimum-150 Cms, weight minimum 45 Kgs and chest minimum expansion is 5 cms. For female candidates Height minimum-137 Cms, weight minimum 25.4 Kgs and chest minimum expansion is 5 cms. Candidate age limits are 14-21 years and for SC/ST/PWD and ex-serviceman age limits are applicable. After receiving applications candidates will be shortlisted based on their qualifications. Those candidates only called for written examination. Those who are clears the written exam, for them only certificates verification or interview will be conducted followed by Medical Tests. Written exam will objective type and syllabus topics for written exam is mathematics, General Science and General Knowledge. Candidates must have to register online @www.apprenticeship.gov.in for Apprenticeship Program. After registration completion registration form will be send to your registered mail id. Take a printout and attach with your application. Prepare application form with necessary information. 2 copies of registration form, application form, age, community, educational qualifications certificates copies to be reachable to the below given address on or before the due date. Refer official notification for address.